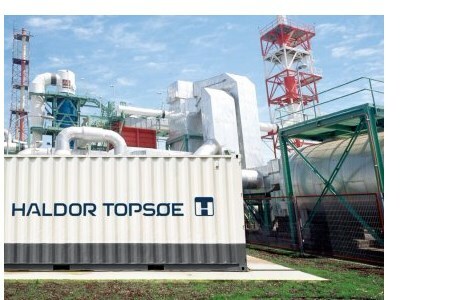 Haldor Topsoe’s eCOs is a new electrolysis cell technology that allows safe, efficient, and cost-competitive production of carbon monoxide directly at the site of facilities where the gas is needed. The CO-generation device uses feedstock carbon dioxide and electrical power to produce CO in quantities ideal for most operations that today rely on cylinder or tube trailer supply. “We have experienced a very stable daily production of CO on the eCOs unit, since we put it into operation in January 2016. The flexibility is outstanding and we can scale the production and choose the necessary purity for our needs at any given time. So we have chosen to sign a 15-year pay-per-use agreement with Haldor Topsoe for an additional eCOs unit with ten times larger capacity,” said Ashley Madray, Executive Vice President, Gas Innovations. The new unit will be able to produce 96 Nm3/hr (3650 SCF/hr) CO at up to 99.999 vol% purity and is expected to be online at the end of 2017. The unit is modular which ensures a small footprint and fast installation on site. The agreement includes remote monitoring, replacement of electrolysis parts, and training of operators. Onsite CO generation is a significant development to the medical, pharmaceutical, metallurgy, electronics and specialty chemicals industries, which require carbon monoxide in their processes. The eCOs technology ensure security of supply, eliminates the need to transport hazardous gas, and drastically reduce costs related to storage, rentals and connections. In the longer run, this technology opens up for a whole new segment of green and sustainable chemicals from renewable carbon sources.